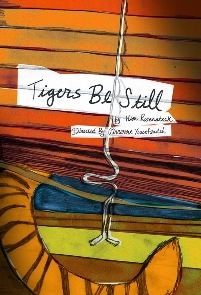 Partly Cloudy People presents the first New York revival of Tigers Be Still, a wonderfully touching dramedy by Kim Rosenstock (Yale ‘10, staff writer for New Girl). We are fortunate to have a very talented director, Pirronne Yousefzadeh (Columbia ‘09), who brings perceptive insights to this beautiful piece of work. Our production will run May 9-25, 2013 at The Drilling Company, 236 West 78 Street New York, NY. Tigers Be Still is a hilarious and touching dramedy exploring depression and the human capacity to stand up, dust off and start over. The play sheds some surprisingly funny and heartwarming light on this seemingly dark subject. This production will serve as a fundraising and awareness campaign for The Ackerman Institute for The Family. Ackerman is one of the leading counseling services in the country. Since 1960, the Ackerman Institute for the Family has achieved international prominence and earned national awards for the development of innovative models of family therapy, professional training and community programs for families facing major challenges. One of the first training institutions in the United States committed to promoting family functioning and family mental health, the Ackerman Institute is dedicated to helping all families at all stages of life. Learn more about our Associate Producer Nicu's Spoon.